Haiti and the Dominican Republic are projected to lead Caribbean in economic growth over the next two years, according to the latest update of the International Monetary Fund’s World Economic Outlook report. In 2014, the Dominican Republic is projected to lead the region with a 5.3 percent increase in GDP, followed by Haiti at 3.8 percent. In 2015, the Dominican Republic is once again projected to lead the region with a GDP growth rate of 4.2 percent, with Haiti at 3.7 percent. (Guyana is projected to be second in 2015 with a 3.8 percent rate). That means a two-year average GDP growth of 4.75 percent for the Dominican Republic and 3.75 percent for Haiti, the largest in the region over that period. The next strongest economies in the region? Guyana and St Kitts andNevis. 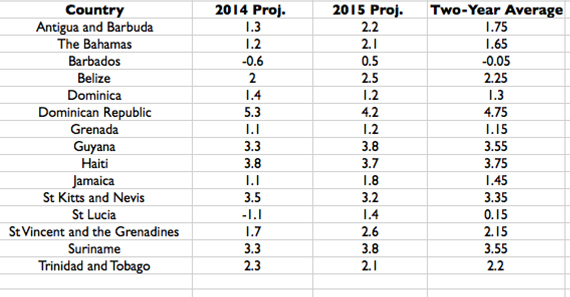 Indeed, St Kitts is projected to lead the English-speaking Caribbean in economic growth in 2014 at 3.5 percent. For the full data from the latest World Economic Outlook, see below.